The expressway is S10 between Szczecin (Poland’s largest Baltic seaport) and Motaniec, in the north west of the country; it carries 17,000 vehicles a day, 12% of these heavy goods vehicles. Nynas E 85 is a bitumen specially formulated for emulsion production and is produced according to EN 12591 and Nynas sales specifications. A thin film surfacing specialist set out to prove to the Polish roads marketplace that microsurfacing technology can provide ultra thin, low environmental impact wearing courses even for high stress sites. 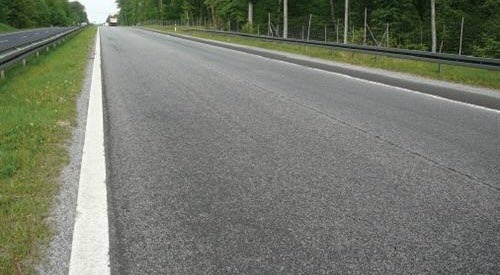 Six hundred metres of principal expressway in Poland were surfaced with a trial 15mm thick microsurface layer. The contractor which carried out the experimental work was local microsurfacing specialist Emulex Kalinowski, which used an emulsion based on a Extra grade bitumen product from Nynas. Now – after many months of heavy traffic – the surfacing is performing well. The trial indicates that cold microsurfacing, in certain conditions, can provide a viable alternative to other surfacing methods. Materials used for microsurfacing have to be carefully selected. For S10, the aggregate was a blend of 8mm stone plus 2mm fines; the fines making up 40% of the mix. Because the asphalt was going to have to withstand heavy loads, a bitumen binder of paving grade 70/100 was specified. Microsurfacing cold mix systems rely on bitumen emulsions and choice of the bitumen is absolutely crucial. Emulex was responsible for producing the emulsion and turned to its favoured supplier Nynas. Together they agreed that Nybit E 85 was the right product for the job. From Nynas’ Extra range of products, Nybit E 85 is a bitumen specially formulated for emulsion production and among its benefits are the fact that the bitumen helps produce an excellent quality of emulsion, with improved adhesion to many types of aggregate, allowing greater freedom in aggregate choice, better cohesion and resistance to physical hardening. The surfacing work was carried out by Emulex from the beginning of September 2010. Firstly, cracks and potholes in the trial section of S10 were made good prior to the laying of new material. Then, using a self propelled Breining SP8000 Slurrypaver, Emulex first mixed the emulsion and then laid the microsurfacing in two passes, to a total thickness of 15mm. The work was carried out effectively and rapidly, with the road re-opened to traffic after an hour. Following the harsh winter of 2010/2011, the condition of the microsurfacing has been subject ed to scrutiny, to see how well it had performed. There is no sign of deterioration and all parties are happy with the way the material has stood up under heavy traffic. The trial section is still under careful observation.